When it comes to downtown Stockton redevelopment, no one has been more successful than Dan Cort. Cort started out renovating Victorian homes in the Magnolia District and today his portfolio includes such historic downtown buildings as Cort Tower and the Kress Building. He also penned the book “Downtown Turnaround: Lessons for a New Urban Landscape,” detailing his successes in Stockton and what needs to be done to revive downtown. In addition to redevelopment, Cort advocates for smart growth policies; one of the main tenants of Stockton City Limits. In a speech at the San Joaquin TEDx event earlier this year, Cort called on Stockton to use its bankruptcy crisis to recommit to the city, not the suburbs. After many articles discussing the need to revitalize downtown, I decided it was time to talk to someone who had not only done just that, but became tremendously successful along the way. In late December, I had the opportunity to speak with Cort about his work in Stockton, why the city is in such a financial mess and what he thinks needs to be done to revive it. We also discussed new projects coming down the pipeline, including the redevelopment of the B&M building as well as a possible partnership with UOP to bring a student program– complete with student housing– into the Elks Building downtown. In your opinion, how has Stockton gotten to this point, and what does the city need to do to be successful moving forward? We are bankrupt because we invested our community’s future in things that don’t work like sprawl, paving over farmland. We have enough information now to know that Stockton needs to contract, not expand. Bankruptcy should serve as a clarion call and the biggest opportunity for Stockton to get it right, to stop building on farmland at the expense of downtown. If Stockton doesn’t get it right after this, there isn’t a lot of hope. How many times have you seen a lung cancer victim leave the hospital and light up a cigarette? We can’t return to the ideas that got us here in the first place. If Stockton can make that commitment to look after its health, to stop smoking cigarettes, we can make it. We will not make it if we continue to spot zone and spot develop. A lot of people in this community say that no one will live downtown because of crime. If you build it, no one will come. How do you advocate for bringing residential development downtown when there are many who believe it would not be successful? I say “grow up.” Where are you going to be so insular that you will never run into crime? Is it really all that safe up on Hammer Lane? Stockton is only as dangerous as the people who live here believe it is. Yes, there are issues of homelessness and probationaries, but downtown can’t hold a candle to other areas of the city in terms of crime. Downtown is only dangerous because we don’t have people in the neighborhood. Wouldn’t you want to be able to walk to the ballpark? Walk to the theaters? Walk to work? Stockton has 300,000 people and will probably have half a million in the next ten years, where do you want them to live? If I’m a creative person looking to live in Stockton, I want to be able to sail or row on the Delta; I want to be able to hop on the Crosstown Freeway quickly when I need to go somewhere; I want to be able to have access- with or without a car– to the places I want to go to. You’ve done almost exclusively commercial development, would you work on residential projects downtown if you had the opportunity? Yes. The reason I haven’t built residential is that I need to know that there is a support group, that city policy will support me until it’s done. The city supported the ballpark development, it’s time to support infill. If you want to bring people into your core, then you do infill. It’s what makes good cities great, and great cities exceptional. If we allow the (traditional) developers to continue doing what they were doing, and the city goes along with it, who’s going to pay for it? You have been very successful in downtown Stockton, but it seems bureaucracy and city policies continue to make it difficult for someone like you to come in and help rebuild downtown. Is that a fair assessment? Unfortunately that’s true. For 30 years it’s been a battle for the most part. There have been bright spots at city hall where we’ve had community development folks and building inspectors who have not made it their mission to make life difficult. I don’t want to make it sound like I am complaining, because I’ve been successful (redeveloping downtown buildings), but if you notice, there aren’t very many people doing it. There’s no one doing it, essentially. The reason is that they can’t tolerate the impediments that communities like this have, such as governmental and economic impediments to redevelopment. I want more developers downtown, I don’t want to do it alone with just a few of us. There are things like facade loans and economic development zones that are out there for us, but if the city’s philosophical direction as a community is to grow east, west, north and south, no matter what incentives you add, they won’t provide the results that you want. The Record recently reported that Cort Companies in the process of acquiring the B&M building downtown, have you made progress? What can you tell us about the project itself? We should be closing soon, we are waiting for one organization from Sacramento. 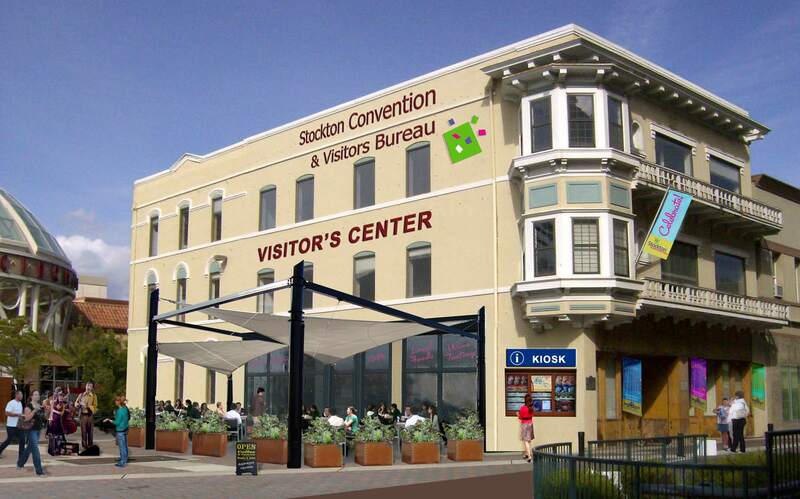 As far as the building itself, the second floor will house the Stockton Convention and Visitors Bureau. We’d also like to do something with the Dave Brubeck Institute, possibly a jazz club featuring the history of Brubeck’s social contributions. On the ground level, we want kind of a taste of San Joaquin featuring cheeses and wines of the area with a nice locavore-themed deli. Maybe a few things associated with the local baseball team, food, activities and so on that would brand us with the Ports. What is the response when you reach out to these organizations about the ideas you have for the B&M building? We’ve had a very positive response. They all want to have something going on downtown because they believe in what we are doing. This is a small building, around 13,000 square feet. The ground level will be retail, something that will compliment and bring people to the area. It would play off the large numbers of people who come downtown for events like the Asparagus Festival. It’s very well situated, right near the water. It’s been my experience that universities can play a big role in downtown redevelopment, bringing students in to transform the area. 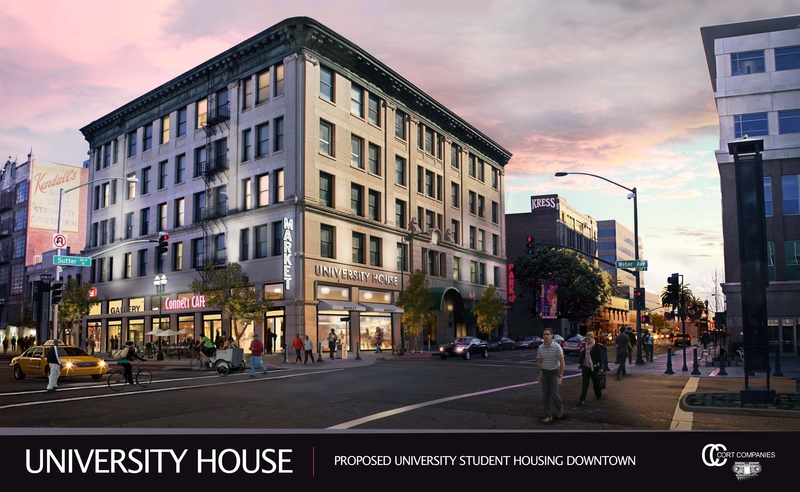 I am curious, have you or the city approached UOP about bringing students downtown in some capacity? The answer is unequivocally yes. The current administration at UOP is the most inline that it has ever been with their “Beyond Our Gates” program. We are encouraging them to create a university program– I call it the Urban Studies program– in the Elks Building on the corner of Weber and Sutter. We put together a rendering of what we could build them: internet cafe, student residential units on the upper floors, bicycle rickshaws on the outside. It’s beautiful. We’ve discussed courses or a program in urban studies where I could possibly teach a course. It’s not a done deal, but it’s certainly in discussion, and UOP has certainly shown the heart and soul to go after it. There are a lot of details that need to be worked out, but this would effectively create that “Beyond Our Gates” environment that they really want to have. The city recently issued a request for information for new city hall space since the Washington Mutual building plan fell through. In your book you discuss how government tenants are ideal. Could Cort Companies facilitate the city’s request? I hope so. We have several buildings in our portfolio that we would love to work with the city on. It’s a great opportunity for the city to make a commitment to downtown. We have a few prospects that could give city employees– who are undermanned– a nice environment to help make the city go. They should get all of their offices in one central space, and within two or three blocks of the current city hall, we have some good prospects that we are going to show them. We love the idea of getting to work with the city. Every other RFP seems to be for north of March Lane, so this is a great opportunity for us to show our stuff. Your first book, “Downtown Turnaround,” profiled the successes you have had restoring Stockton’s historic structures. You are currently working on a second book, what can you tell us about it? it’s called “The Do it Yourself Nation.” I haven’t talked much about it. It’s not scheduled for publication until mid next year. My first book, “Downtown Turnaround,” was about how we’ve evolved, some success stories and what happened in Stockton. “The Do It Yourself Nation” fast forwards us to today and what to do when you can’t rely on your city or government to do what it is supposed to. It teaches us to be self sufficient, to rely on each other because when you need something done, and you can’t rely on someone else to do it, you have to get it done yourself. Working with friends and neighbors to accomplish things has become more valuable. On a local level, we have need to be more responsible. We need to shop locally. We need to eat locally. We need to understand how to take care of ourselves, how we can take care of things more effectively than government currently does them. Good stuff. In such case the City should give Dan Cort & Co. the tools needed and let him lose. There is no good reason to curb someone’s manifested desire and dedication towards a better downtown. It was great to read the interview with Dan Cort. As a denizen of downtown – my office and residence are both downtown – I look forward to many others joining me. I was especially gratified to see the prospect of a Brubeck Institute affiliated jazz club established here to join the other great venues, (e.g., Valley Brew and Whirlows). Just recently opened up a media studio downtown. I think it was a great choice but the city needs to do more in attracting young entrepreneurs like myself. do you live/work in the same space? I’m not. There are good venues that already do well with that. To open yet another will not attract more business but rather decrease the business the others already have. This is common in Stockton. One place has an original thought, nurtures it, creates a following, and then five other places open trying to copy it and everyone fails including the place with the original model. Stockton doesn’t need another wine, cheese and jazz place. They need a privately owned, unaffiliated with anyone venue that brings a variety of up-and-coming and established artists and pairs them with local talent that appeals to a broader demographic. Valley Brew and Whirlows are not “wine, cheese and Jazz” places. They offer live jazz music one to two days per week during “the season” . That leaves many open days; many opportunities for our great local artists to play; and there is no regular downtown venue for food and spirits and live jazz and other music. If there is any city in California that should fundamentally support jazz, it is Stockton, and it should be prominent downtown as well as uptown on the Miracle Mile. The more folks we attract downtown for music, the more will come for other downtown activities. The more folks who hear good, live music downtown, the more folks will patronize all the music venues vs sitting at home in front of their idiot TVs. I’m quite familiar with what Valley Brew and Whirlows are. They offer as much Jazz as Stockton is willing to support. There are many open days because that is all they can get a regular crowd for. Saying,”If there is any city in California that should fundamentally support jazz, it is Stockton” doesn’t make it so. Wine and cheese deli’s and jazz clubs are a very narrow demographic in Stockton. For success and impact it will need to cover a broad range. it’s good to hear a developer talk about re-develop what’s already there and stop developing where it does no good. I don’t believe any developer deserves carte blanche though. I think that was the problem to begin with. One thing I don’t hear much about is re-zoning to allow work/live space. As a small company based in arts and events, in todays economic climate it’s not finically feasible to rent a separate space for business. Maybe it’s just because when I’ve dealt with the City the rules, fees, and zones seem to always change. I do appreciate what Dan seems to be trying to do and would like to see City management make it easier for the citizens to implement their own form of re-development to add to it. I agree with most of what everyone is saying…however, Cort Companies idea of downtown development is office space and ‘low-end’ retail. It is evident by the types of businesses that occupy retail locations and the office occupancy rates. There are significant vacancies for office space and a lot of BAD retail…retail that attracts the wrong crowd. Don’t get me wrong, Dan has done a great job and paved the way…but I would say his son, Zac is sending downtown in the right direction. I would invite you to check out http://www.thecortgroup.com and would invite anyone interested to reach out and see what they are doing. The next six months will see more development than downtown has seen in the last 20 years.